Is it Day 3 already?! We hope you are loving what you see so far! Today we are highlighting Freestyle Florals! Elena worked some masking magic for this floral 1-layer card. We love the watercolored, subtle wash of blue, with the sentiment (from Bear Hugs) in colors to match. Laura used the stamps & coordinating dies to create this fun floral frame. She layered up the flowers using foam tape and stamped a sentiment from the Bear Hugs stamp set. 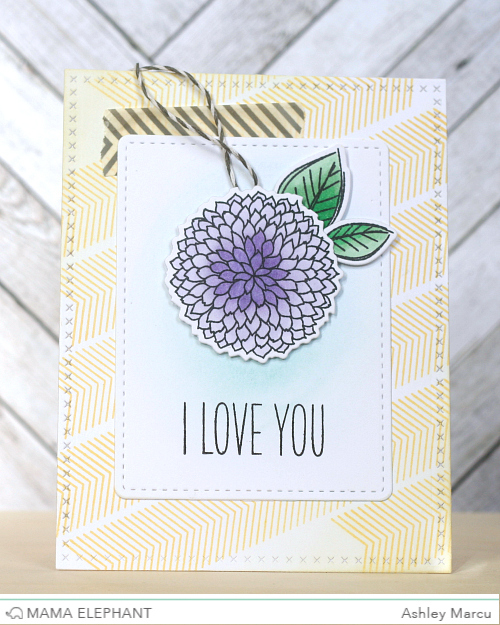 Ashley colored a flower and leafs from Freestyle Florals to create the focal point for this card. The soft colors really help the flower to pop. 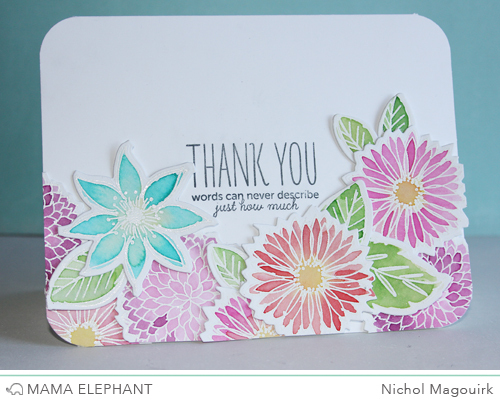 Nichol embossed the Freestyle Florals with white embossing powder and watercolored the designs before diecutting. The florals add the perfect frame for the Bear Hugs stamped greeting. 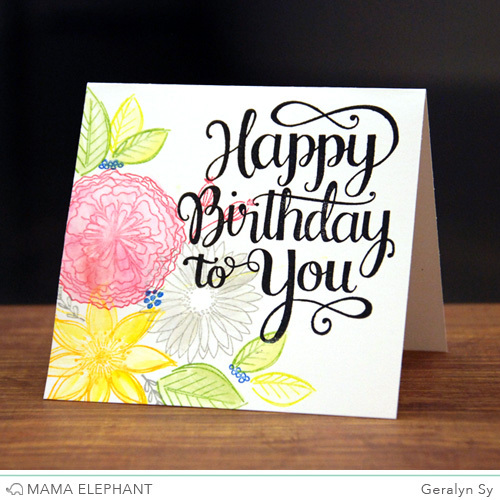 Geralyn used various Mama Elephant pigment inks to stamp the florals, and then she watercolored them for a fresh look. We love how the bold sentiment from Make a Wish contrasts with the soft colors! Come back tomorrow as we highlight our last set for February! Oh my gosh this is my favorite new set! Onto my wish list it goes! Love all the gorgeous inspiration. These are gorgeous! I love these pretty flowers. These flowers really work well with the watercoloring. Wow, these are all fabulous! Everyone's cards are absolutely gorgeous! Yep, LOVING what I see. I love these flowers. I can see so many uses for this set. Add them to my wish list....In fact, my wish list has grown after seeing so many beautiful cards from all the stamps I have seen at the blog hop. Thanks for sharing everything with us.